This mango mousse is my definition of heaven. It is indescribably smooth and airy. It is brimming with the fruitiness of succulent mangoes, the kind of sweetness you long for more. It is infused with the delicate fragrance of roses, immediately transporting you to the mystical rose gardens you’ve heard in Arabian Nights. 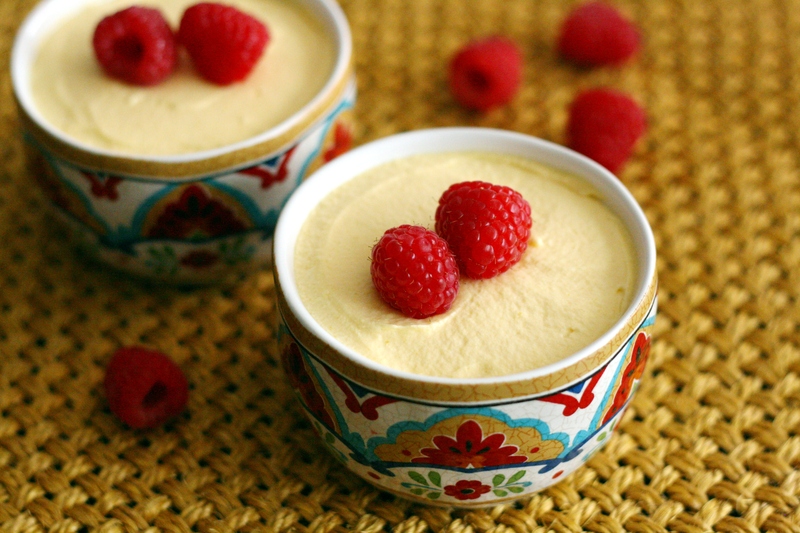 It is studded with raspberries, like the jewels of Princess Jasmine. Yet, it is incredibly easy to whip up in almost no time. Oh, and it is egg less, so even the paranoids can relish this in peace. Chop the white chocolate and melt it in a double boiler (heck, even a microwave will do. But check on it every 30 sec until it reaches a smooth molten consistency when stirred). Mix it well with the mango pulp until no streaks are visible and set aside. Pour the whipping cream in a cold bowl. Add sugar and rose essence and whip until soft peaks form. Now gently fold the whipped cream into the mango and white chocolate mixture. Do not over mix, or you will flatten the mousse. Its okay if it is streaky, taste will not alter. Fill individual bowls with the mousse and cover it with plastic wrap and chill until you are ready to eat…which was an unbearable 10 minutes for me. 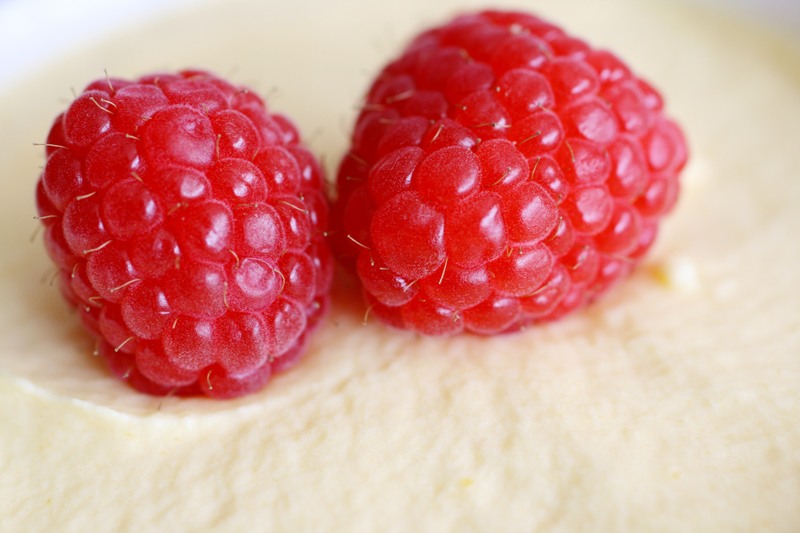 Decorate with raspberries before serving. Relish the smooth mouth feel in every bite! This sounds and looks really incredible. This must taste so amazing! Lovely dessert. Thank you. I am glad you like it….and will not disappoint you. It looks wonderful! I adore mango in any recipe. Thanks! I am sure you’ll enjoy it. This looks delicious, I really want to make it, but am confused by what you mean by mango pulp. I’m planning on using fresh mangos, do I puree it then strain it- and use the liquid only? Thanks in advance! Ru, you can do it with fresh mangoes!!! It will be even better than canned pulp. Make sure you run the pulp in a food processor or blender so that it is not fibrous. Just in case the mangoes are very juicy, you might want to strain some liquid off. I adore fresh mangoes, but they are not available most of the time. So I end up using pulp from a tin.